One thing unites the wealthy Farthing family and hardworking Dilly Carey - Olivia, the daughter Dilly gave to the Farthings years before. 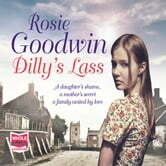 Dilly is still living with the consequences when unmarried Olivia arrives on her doorstep, with a baby girl in tow, begging for help. Olivia has a secret she only feels safe telling Dilly. Sworn to secrecy, Dilly agrees to help. She will find a way for Olivia to keep her daughter without revealing the true circumstances of her birth.